The frightened animal was discovered perched about 50 metres above the ground. "When they are really scared, they will just react to get away from the danger and not realise they're putting themselves at even greater risk," said animal rescuer Manfred Zabinskas. 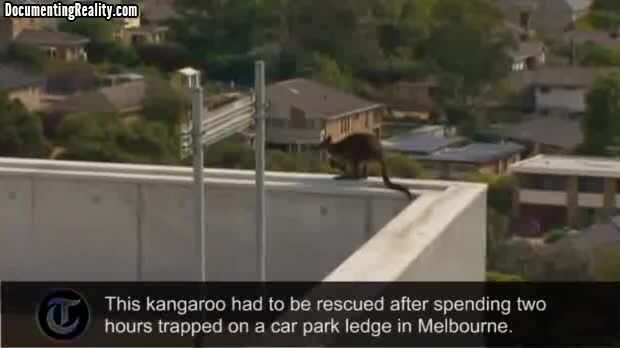 The kangaroo eventually hopped down from the ledge and into the safety of the car park, where he was shot with a tranquilliser dart so that he could be taken away from danger altogether. The animal will spend several days being looked after at a local wildlife centre before being returned to the wild when he has fully recovered. Whew....happy he didn't go over the edge, poor thing! Lucky he was in the city, cunts would have just killed him in the outback. good thing he didn't panic and jumped the wrong side. He's just a little guy. Those animals are so cool. I wish we had those in the states. I love kangaroos but they are a plague. I know cunts who make like $1000-$1500 a night shooting them. I'd never do that though. I walk my dog and see like 15 of them everyday. Although most of the ones i see are wallabies. They are like the white tail deer here in the USA. Beautiful but causing a lot of car accidents. Glad this one is ok.